Calamari and crab star in this curry dish — along with an unexpected ingredient. Yes, watermelon, of all things. Crisp cubes of it, as well as its own bright pinky-red juice. Of course, with summer watermelon in abundance, it was the curry recipe that really intrigued me. Sure, I’d enjoyed my share of watermelon just eaten out of hand in big cold wedges. And I’d eaten plenty of watermelon salads accented with salty feta or pops of chiles. But in a warm seafood stew? This was a new one. Summer watermelon used in a unique way. The base of the broth is watermelon juice that is cooked down on the stovetop to concentrate its flavor. You think it’s going to be way too sweet, but not after you add in ginger, lemongrass, garlic, turmeric, coriander, cumin and chiles, as well as fresh lime juice and fish sauce. Squid cooks up in mere minutes in a saute pan, and is added to the broth, along with cooked crab meat. 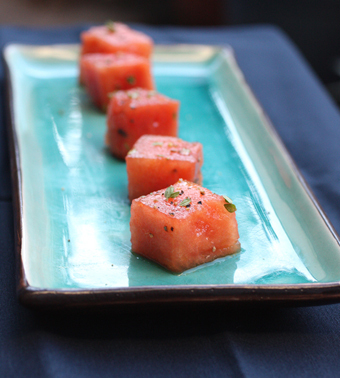 Garnish with chopped cilantro and cubes of watermelon, and you are done before you know it. 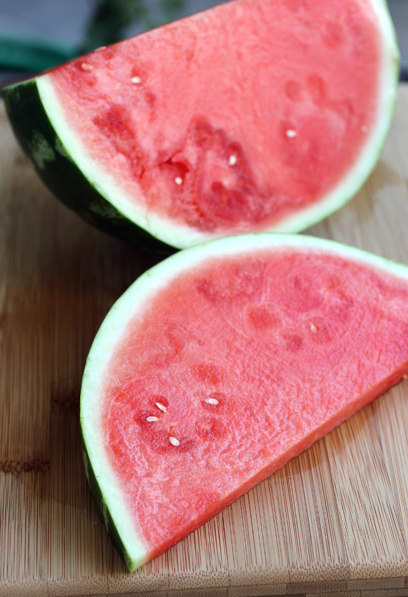 You can definitely taste the fruity sweetness of the watermelon. But you also get hits of earthiness, saltiness, tang and spice — the hallmarks of fine Asian cooking. It’s a far more complex tasting dish than you’d ever expect. Make some plain steamed rice to spoon into a brothy bowl at will, if you like. 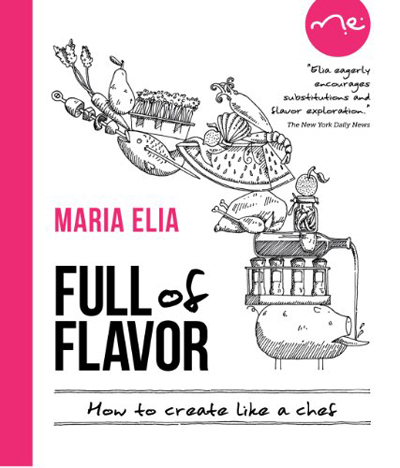 Elia writes that this is one of her most-talked-about recipes in the book. One taste and it’s easy to understand why. To make the curry, liquefy 3 1/2 pounds of the watermelon in a blender or food processor until smooth. 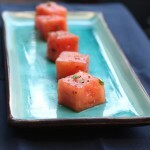 Cut the remaining watermelon into 1/2-inch cubes and set aside. Heat half of the oil in a large frying pan. When hot, gently cook the onion, ginger and garlic until soft. Add chile, lemongrass, and spices and cook for another minute. Add the liquified watermelon, bring to a boil, then simmer until reduced by half. This should take about 20-30 minutes. To prepare the seafood, heat the remaining oil in a large frying pan. Season the squid with salt and pepper and cook in two batches over high heat for 3 minutes per batch. Set aside. 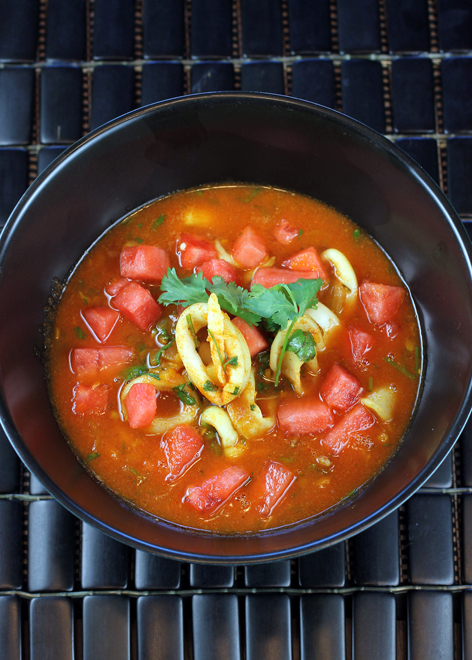 Once the curry has reduced, add the squid, crab, cilantro and the diced watermelon that you set aside and gently heat through. Add fish sauce and lime juice to taste — the curry should be hot, sweet, and sour. Serve immediately. A very original combination! This curry looks delicious. 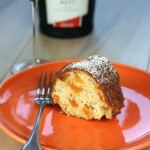 A georgous & very appetizing fabulous special recipe! When I first saw the photo I thought it was a gazpacho….but this looks exciting and fun to try! Watermelon in curry is really different! Or at least I’ve never seen that before. Sounds so interesting – thanks for turning us on to this idea! This does sound amazing, and I am reluctant to even ask about substitutions before first trying the original, but since the tile of the cookbook includes “How to create like a chef”, I am emboldened. Wow, this is indeed very interesting…I thought that was tomatoes…watermelon in curry…and seafood…something to try. Carroll: I think you could easily substitute shrimp for the calamari. You could probably do fish, too — something mild and flaky like halibut or sea bass. As for grapeseed oil, feel free to just use neutral canola oil. That would work just fine. Grapeseed is often touted for its high-smoking point. But it’s not like you’re deep-frying in this dish, and canola holds up well to heat, too. This is the second watermelon curry I’ve seen in two days! I’ve had a watermelon curry years ago and it was so delicious so I definitely know how great it can taste! What an intriguing combination. A few years ago, when I saw Bobby Flay grill some watermelon, I was totally intrigued. I never tried anything like it, but when I tried it, I told myself to never question an esteemed chef haha. THis combination intrigues me. 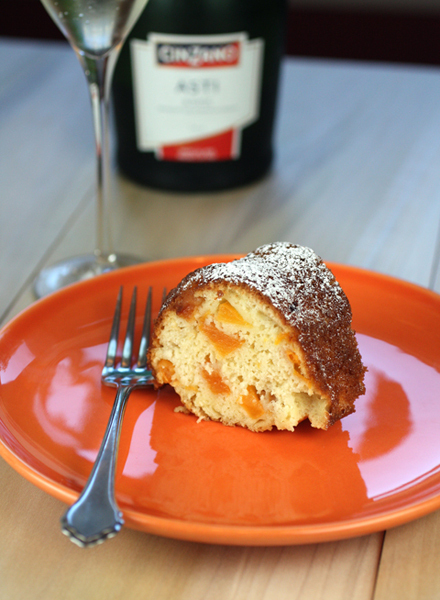 Definitely a must try… but no doubt, I know it sounds soo good. OOH, the watermelon is an intriguing addition to the curry! Nice!